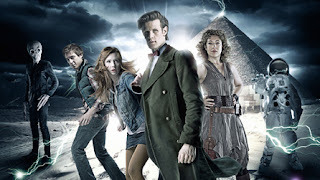 tv-ooh: tv we like to watch on the tv: Doctor Who: Let's Kill Hitler review - the only River in the, er, River, is a River? So the sort-of controversial title of Let's Kill Hitler, kicking off the second part of the latest series of Doctor Who, was all a bit of a red herring as it turned out, despite some background business with the Nazi dictator himself. It's more just a throwaway line as an example of all the kind of currazzy stuff you can do with a time machine. But the person who says the line is far more interesting - a new character, Mels. She's the childhood friend of Amy and Rory, and has had a lifetime of trouble arising from hearing about young Amy's stories of the Doctor. Mels barges her way into the action as Amy and Rory meet up with the Doctor again. In a cornfield. It's mad, of course, and very fast moving; and all with the Steven Moffatt-patented quippy lines of clever dialogue. Mels feels like she could be a new companion, until she's shot in Hitler's office - he's in a cupboard by now - and then she regenerates into the woman who will become River Song (Mels short for Melody, and who Amy named her baby after, but Mels/River is Amy's baby). But, after Mels/River was kidnapped as a baby (as seen in the last episode), she'd been conditioned to hunt down and kill the Doctor, hence Mels befriending Amy and Rory. But despite all of this, the cries of "It's so confusing!" thrown at the first part of the series by some, so far don't apply - tv-ooh understood it, and tv-ooh generally has to ignore the plot and just enjoy the spectacle. All of it now makes a bit more sense, and questions have been answered - and to viewers who have followed the series and the character of River Song, we've now seen how she began, and how she surrendered the remainder of her regenerations to save the Doctor, who she had poisoned earlier in the episode while still under her murderous conditioning. And, as the Doctor, Amy and Rory leave her recovering in some space-hospital (was that a cat-nun? ), the Doctor places the brand new TARDIS-shaped diary that we'll see later/have seen before. SO YOU SEE IT ALL LIKE TOTALLY MAKES SENSE NOW. Just got the problem of getting around the whole Doctor getting shot by an 'Impossible Astronaut' now. And the promo-photos of Rose, Martha and Donna, shimmering in the TARDIS as the poisoned Doctor faces certain (but not certain) death, is a teasy fan-thrill all of its own. Watch the episode, enjoy the fun. Then have it all ruined by watching Doctor Who Confidential afterwards. Hmmm.